Communication between different VLANs require router or some form of routing. Routing between the VLANs can be done using layer 3 switch or use more popular form of inter-vlan routing called router on a stick. Layer 3 switches are pretty expensive which is the main reason why router on a stick configuration is popular. In this article, I will show you the steps to configure inter VLAN Routing in Cisco Router also called router on a stick. The diagram below shows our scenario. The switch is configured with two VLANs 2 and 3. PCs in VLAN 2 will have IP of 192.168.2.0/24 network and PCs in VLAN 3 will have IP of 192.168.3.0/24 network. Similarly, Host A and Host E are on VLAN 3, and Host B and Host C are on VLAN 2. Each host have IP assigned as shown below. For inter vlan routing to work, you need to create TRUNK link between Switch and the router. Here, we need to create TRUNK link between Switch1 and R1. Fa0/0 of R1 is connected to Fa0/7 of Switch1. The interface of router connected to switch must have sub interfaces created with dot1q encapsulation. A sub interface is a logical interface that is part of the physical interface. The sub interface can be configured with different IP address. You can configure many sub interfaces under same physical interface. Now, let’s start configuration with R1. Above configuration creates two sub interfaces, fa0/0.2 and fa0/0.3. Command encapsulation dot1q 2 means this sub interface will accept frames tagged with VLAN 2 on them. IP address command simply assigns IP address to the sub interface. You can view the list of interface using, show ip interface brief command as shown below. As you can see above interface fa0/0.2 and fa0/0.3 are up with their respective IP address configured. Now, let’s configure Switch1 with TRUNK interface. Now, let’s ping Host C (192.168.2.2) from Host E (192.168.3.2). 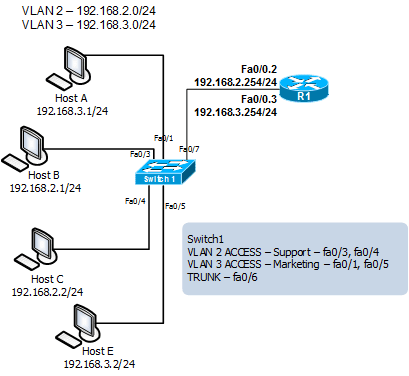 In this way you can configure inter-vlan routing on Cisco switch and router.